My husband and I love to make curry. It's quick, and easy and soooooooo good. We get curry paste (I like red best) from the Asian Market, and follow the instructions on the back. Generally, its a tablespoon or two of paste, mixed with a can of coconut milk, veggies. If we feel like adding chicken, we cook it in some coconut milk in a sauce-pan before adding it to the curry. Now- nothing pairs with curry quite like Naan. 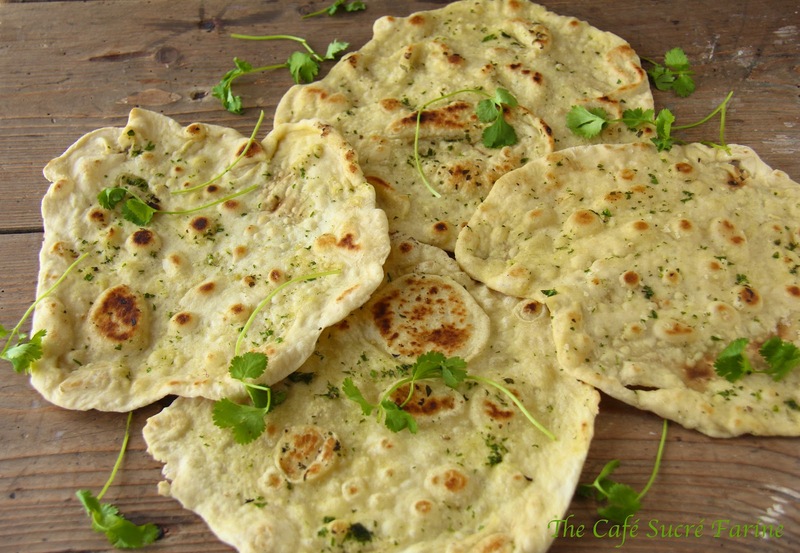 Naan is like a middle eastern tortilla. It's awesome, but until now, I have had a horrible time finding a recipe that is on par with the naan I've had in restaurants. I found this recipe on Pinterest from The Café Sucre Farine, and it does not disappoint. The only thing I did differently was mix the herbs into the dough right before cooking, rather than brush them on. Another tip- make sure you get the dough really thin before you cook it, so there aren't' any doughy spots. 3. Cover (not airtight), and allow to rest at room temperature until dough rises and colapses (or flattens on top), approximately 2 hours. 2. 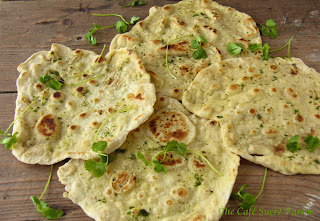 When you're ready to make the naans, remove dough from refrigerator. Liberally sprinkle flour on a work surface. With a large spoon, scoop up 10 lumps of dough about the size of a small apple. Refrigerate remaining dough for another use (check these out). 3. Roll dough balls in flour to coat all surfaces, then flatten each with the palm of your hand. With a rolling pin, roll dough into circles (don't worry, they don't have to be precise circles, real naans aren't supposed to be perfectly round) about 8 inches in diameter. Keep work surface well dusted with flour to prevent sticking. Stack rolled dough circles on a platter, separating them with parchment or waxed paper.